for success to compete in an ever more challenging marketplace. After several years of working together in various capacities, I wanted to acknowledge the particularly fine job you did with our two newly recruited sales staff. You’ve always been so accommodating with some of our unique requests when it came to training our staff. This was the first time you presented us with your initial training program and I was very pleased with the outcome. They are both doing very well and we plan on having you back very soon for a follow-up. It’s always a pleasure working with you Eddie. Thank you. Thank You for the breath of fresh air! Since we have made the decision to utilize Eddie Tock and the training tools you have provided, we have done nothing but grow. Precision is a club less than 2 years old, family owned and operated. We were hesitant at first; our idea was this type of company was for big, urban markets and we were too small for them to work with us. Were we ever wrong…thank goodness. Eddie Tock has helped us grow tremendously. Within one year of working with Eddie Tock we have improved our sales AND retention considerably. Eddie has helped us increase our sales by 43%! Our monthly draft is booming and our referrals our incredible. It is also fun to watch the competition try and play catch up. Eddie’s approach to helping us was not a “cookie- cutter” system. Eddie looked at OUR situation and what OUR goals were and helped us develop a plan. He toured our competition, saw what we offered and showed us how to capitalize on it. We have never looked back. If you are considering a consulting firm, do yourself a favor, call Eddie Tock and let them give you an honest evaluation. I know myself, my family, our staff and our members, that we help everyday, are glad we did. You can’t afford not to call Eddie Tock today! If the quality of his presentations at the Club Industry conferences over the past 16 years is any indication, Eddie’s skills and dedication are, indeed, pure sales-and-marketing gold! Eddie has been a key factor in the growth and success of the company. The enthusiasm and vision he brings to a relationship are contagious for our entire organization. His character and values have been a positive influence on the entire fitness industry. Eddie was true to his original promise; hard work for six months created well-trained, aggressive sales teams increasing their productivity by as much as 70%. Eddie helped our team improve results, no question. Excellent sales trainer who makes learning fun. Eddie has increased our sales by a minimum of 25% each year. He is the hardest working, most professional sales and marketing strategist in the industry. I wish that we had contacted you much sooner. We would have saved a lot of time and money. After years, we are finally hitting membership budget. I know personally that Eddie has help bring numerous clubs results financial success that they would not have otherwise experienced. Your club manager, your staff, and your systems will be better focused, productive and accountable. Eddie is knowledgeable, encouraging, dynamic, supportive and state of the art! Our sales are sky rocketing, renewals keep coming back and all our people are very happy with the club! With Eddie’s strategies & marketing I can rely on my sales team to bring prospects through the door instead of relying on expensive media advertising. If you are a small club, I encourage you to think big and a great first step is working with Eddie Tock. Your services have had the single most positive impact on our company. Your experience and professionalism in the health club operations, customer retention and membership sales would take any team a lifetime to acquire. I am writing this testimonial of the profitable working relationship the Slidell Athletic Club has had with Sales Makers, specifically ED TOCK. We began working with Ed in 1999. At the beginning of our relationship, the company annual gross revenues were about $200,000. Today the company has annual gross revenues of approximately $3.4 million. Ed’s sales and marketing system that we implemented in 1999 has been a key factor in the growth and success of the company. The enthusiasm and vision Ed brings to a relationship are contagious for our entire organization. Ed’s character and values have been a positive influence on the entire fitness industry. We have had the pleasure of working with Eddie Tock for the past two years. Eddie has been instrumental in not only improving our overall sales, but in assisting me throughout the entire facility. Eddie has not only worked closely with our Sales department, but has also trained our Member Services staff, Personal Trainers and Spa employees. While researching a company to assist us in our overall sales process Eddie Tock stood out from the rest due to their knowledge of the health club industry. Within weeks of working closely with Eddie we overhauled our sales approach and learned that our facility cannot sell itself. Our sales team is more pro-active then they have ever been and they have learned the importance of personalizing every sales opportunity. Eddie has proven to us that we are selling a healthy lifestyle, not just memberships, and that we do make a difference in all of our member’s lives. We now expect to successful where in the past we hoped to be successful. We look forward to continuing to work closely with Eddie throughout our entire facility. Eddie Tock is an irreplaceable part of our business. I wanted to take a moment and thank you for all the support and training you have given our sales staff and managers. You have given the sales staff the tools and processes necessary to be successful and confident. This has created a great team environment where everyone understands the goals and how to get there. Not only is the HealthPlex facility in a highly competitive market, we are also priced higher than any of our competition. But with the help of the you and your program we have been able to increase our sales for the year by 56% while reducing our marketing costs. This has allowed up to create a “super star” sales staff that are selling more memberships than ever thought possible. This letter is to share our deep appreciation for all that Eddie Tocks has done for our Wellness Center. Prior to implementing your system, we had reached a low point where our sales were flailing, and we had very limited accountability plans in practice with the current Manager. After just one month, we were able to see significant changes and improvements as to how the team was responding, and each month the changes were noticeably better and better. It was not without growing pains, as we traded out some personnel, and transferred in a new manager, but the net result was outstanding! I love the intentionality in which they now approached the sale – and the emphasis placed on meeting the customer’s needs. In the past, our team did a great job of being “tour guides”, showing off our beautiful facility, but they lacked a concrete road map of how to connect with the prospects on an emotional level, how to turn their needs and wants into a closed sale. I have watched the team grow and it is inspiring! When I first met you at the Medical Fitness (MFA) conference, the Wellness Center had reached a plateau (after 5 years) and we were losing more members each month, than we were gaining. Our marketing department had spent a lot of money focusing their efforts on hospital marketing strategies versus fitness/wellness strategies. Eddie came in and proved himself to be the expert immediately. He was able to slash the cost of our outside marketing and gave us a multitude of ideas for reaching our prospective members (at a very low cost). He also offered new ways to reward our team to inspire them to reach new levels! The program worked, and to me, this is nothing short of a miracle. We now make it a daily practice to “inspect what we expect” and have great tools in place for assessing how well we are doing in each of the key sales component areas, and a wonderful manager who actively supports the system. Thank you, Eddie, for taking the pressure off of me (as we reclaim a positive growth trend), for training and encouraging my staff, for being a mentor to my Manager, and for impacting the Wellness Center’s bottom line is a very profound way. I would like to take this opportunity to Thank You for the training and revitalization that you provided for our sales staff. Not being satisfied with our results, thinking that we could do better, I had been looking for someone or something that could give our sales staff the drive and enthusiasm that was missing. Subsequently we ran the gambit with health club consultants, we had some gains, but not what we were looking for, something was still missing. Over the past few years our sales growth was flat in spite of a strong local economy. We tried everything, but nothing seemed to work. We then decided to look into bringing in an industry sales consultant. After attending one of your seminars at Club Industry we felt that we found the answer. After numerous discussions with other clubs and individuals in our industry we contacted you. Best decision we ever made! First full year our sales increased 20%, second year 15% over the previous year, with net profit increasing accordingly. We could not be more pleased. To keep the momentum going we have quarterly strategic planning sessions. The approach, content, and delivery of your program has produced remarkable results in a short period of time. Our sales staff has a new personality, they’re confident, enthusiastic, professional, and organized and most importantly we’re both seeing the results that we wanted. After having the opportunity to live and practice “Eddie Tock 101”we want to pursue the subsequent programs that you offer. Eddie Tock was certainly a Home Run for us and I would be more that happy to speak to anyone that is considering your program. I have known Eddie Tock for over 25 years, and have also known many the clients that he has retained for decades. 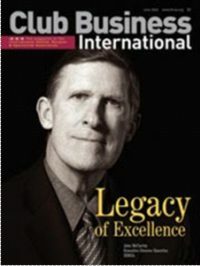 Also, in my years at IHRSA, we hired Eddie many times to educate and inspire young people in the art of developing high performance membership sales organizations. I have enormous regard and respect for Eddie and recommend him to you enthusiastically. He is an honorable and effective professional in every sense of the word.